The definition of stove is any apparatus that produces heat and serves to heat and cook foo. So if we say is that wood stove will burn wood to produce heat for cooking purposes this can mean for any type of food. This includes cooking meat or pizzas in an obviously tasty manner. The use of cooking meat on a fire dates back to a prehistoric era, however, we still cannot resist the delicious aroma when passing a small restaurant and smelling the wood burning. It's such a distinct smell, meaning that the food is full of flavour, whether meat, tortillas or tacos are on the menu. In this Ideabook we take a look at the 7 reasons to have a wood stove or oven at home. Enjoy! For those who like to celebrate all weekend, this is a great idea. A brick structure in yellow that hosts a modern BBQ design. 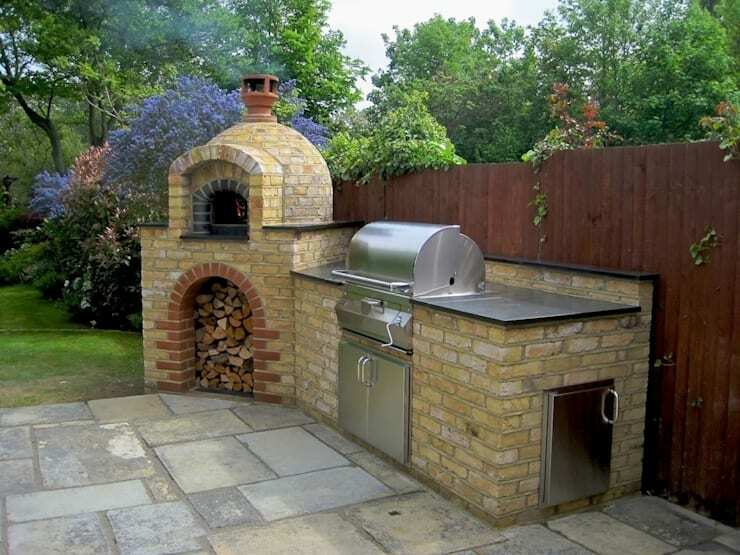 The stellar attraction is the wood oven, which is ideal for making bread or pizza. A traditional idea with a touch of modernity that fits into courtyards, gardens and terraces of medium size. Although there is a more petite version available for smaller outdoor spaces. 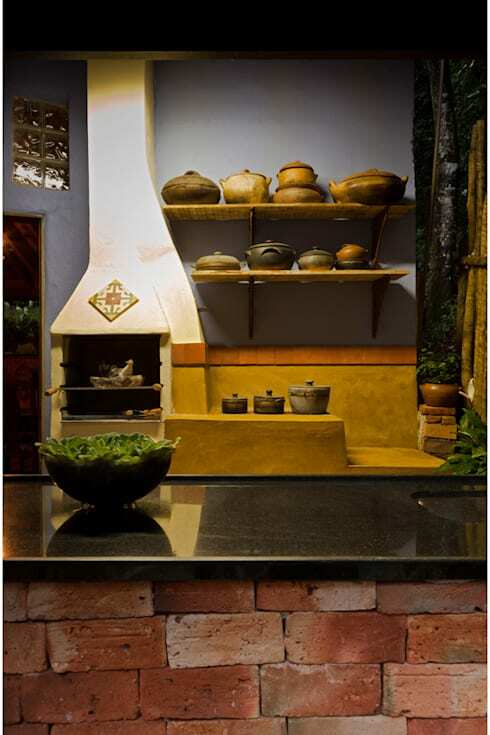 Wooden stoves are not necessarily only designed to be used outside, they are also great for indoor spaces. And if you do not like the old-fashioned brick colour in its natural state, you can paint it for a different touch. Have a look at this stove that is spacious and awesome on a variety of levels, ideal for large family and any season! This wood burning stove is relatively small in size and shape and has a metal door at the opening to control the heat, it has two spaces where you can cook food in that is heated by the wood burning in the closed oven. 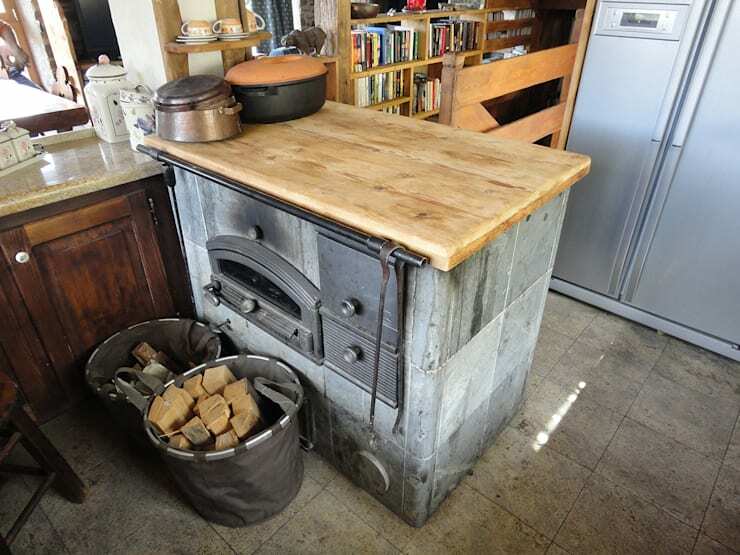 The rustic wood counter is the ideal area to prepare the food on above the heated stove. This is perfect for any kitchen that values the nostalgic qualities of vintage decor and furniture. 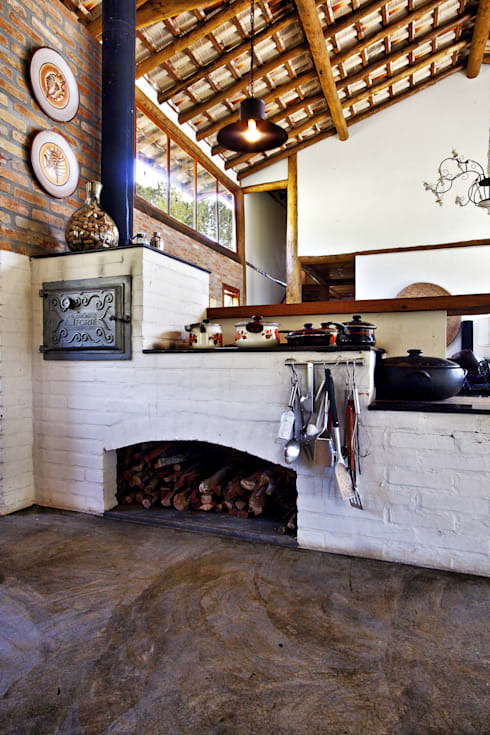 A rustic kitchen can be perfectly created if all the elements from the walls to and floor are taken into consideration, with a wooden stove of course for cooking. Don’t forget the modernity of an electric grill and a refrigerator that makes ice and cold water at just the touch of a little button. Here the water is at the perfect temperature for the climate, warm in summer and teeth grinding cold in winter, but the flavours of the cooking in this house will not be the same as the flavours that we experience in ours, these will be completely organic, real: pre-cooked meats, hamburgers and pizzas, just pop in the oven for 5 minutes. A charming rustic kitchen is primitive, but allows you to eat like a king every time you sit at the table! 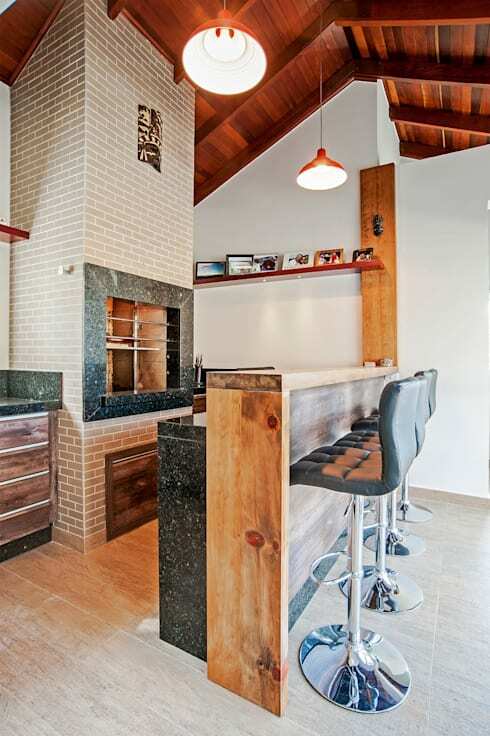 This kitchen designed by Carlos Bratke Architecture makes rustic desirable! A wooden stove and breakfast bar with high chairs is perfect if not for nothing else then as a place to serve pizza for six that has been cooked to perfection on our own wooden stove. It is a great fit for pizzas so excellently made by Italian chefs, but here it has some Mexican flavour added to it before serving. In a room like this, the idea is clearly rustic wood and the rest of the interior decor welcomes anyone who would like to enjoy well-prepared food from wooden stove. 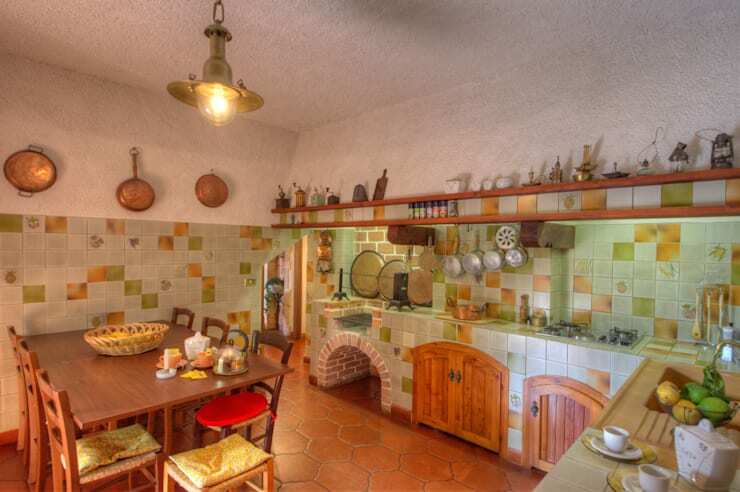 This is a kitchen in a family home where everyone sits at For the table to eat at the same time and knows that homemade food tastes better when enjoyed among dishes that have been cooked on the wooden stove. The wood used in stoves such as this adds to the flavour of the food, while it is definitely advisable to use a harder and drier wood in the stove, such as pine or birch. They are drier than other woods and burns evenly without producing a choking smoke. A fabulous family kitchen and a wood stove will be very welcoming. Don’t you think? When adapting a wooden stove in the kitchen of townhouse, we can include colours to make the fantastic stove in the home more attractive. Think about what your friends will say when they see this gourmet element in your home? 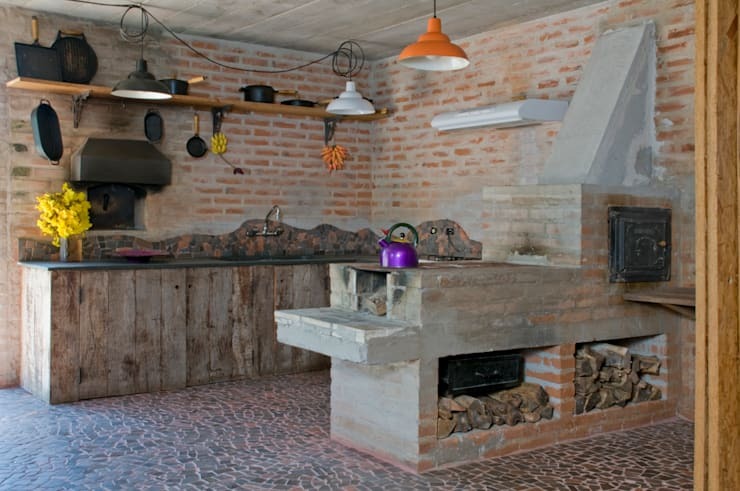 You can sometimes cook in the wood stove because you adore the flavours you experienced on your last vacation to Italy or that amazing Mediterranean food cooked in clay pots, while you adored the smell and taste of bread baked in the wooden stove breads, that you don’t seem to find in your city. For more sizzling summer inspiration, be sure to check out these: 10 Grills For The Best Braais. Would you like a wood burning stove at home? Which kind of design is your favourite?